Co. Clare: Ballyreighter, Boston, Corofin, Glenroe, Killinaboy, Kiltoraght, Muckanagh, Rath, Ruan. The new workhouse, for 500 inmates, occupied an 12-acre site to the east of Corofin. It cost £5,700 to construct, plus a further £915 for fixtures and fittings. 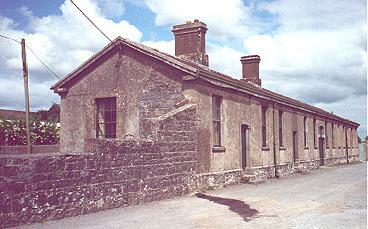 The layout of the Corofin workhouse was unusual for buildings of its period. It differed in many respects from the standard earlier designs found, for example at nearby Ennistymon, but neither did it adopt the typical second wave layouts, as seen for example at Kildysart. Corofin's design was, however, similar to its neighbour at Ballyvaughan built in the same year. The workhouse had an entrance block at the east which included school accommodation. To the rear, the main accommodation and utility blocks linked via a central spine containing the chapel to a small infirmary at the rear. A mortuary and fever hospital lay to the rear of the site. In 1895, Corofin was visited by a "commission" from the British Medical Journal investigating conditions in Irish workhouse infirmaries. Their report suggested a number of improvements: the provision of two trained nurses, one being a midwife; more comforts for the patients such as improved bedsteads and bedding; improved cooking to make the food eatable and appetising; and the provision of running water and improved sanitary facilities throughout the workhouse. Further details are available in the full report. All that now remains of the workhouse is the single-storey front block, now used as a storage depot. At the 1901 census, the population of the Union was 4,803 with 4 officials and 74 inmates in the workhouse.